Love decorating for Halloween, but hate spending a wad of cash? Your humble dollar store may be the answer. Let’s face it: Halloween is a great holiday, but the spending on spooky-themed decor has gotten out of control. In fact, a study from Harris/CIT breaks down the average spend on Halloween home decor to come in at around $50 per household. You could easily blow that $50 on one item at Target—or you could drop just a few bucks at your local dollar store for a far more budget-friendly holiday. You’d be surprised by how little cash it takes to create some clever Halloween crafts! As proof, check out these ideas below. 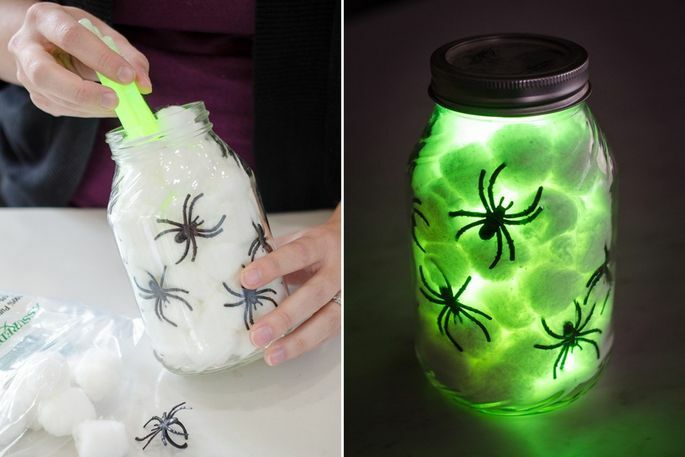 Glow sticks transform a Mason jar into something Halloween-worthy. Simply fill a jar or vase with cotton balls, plastic spider rings, and a glow stick from your local dollar store—and you’ve got yourself a creepy Halloween decoration,” says Demer. 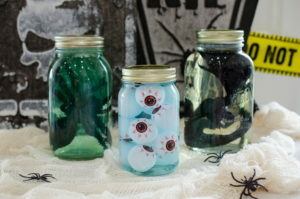 With additional jars, you can create even more dollar store Halloween crafts. 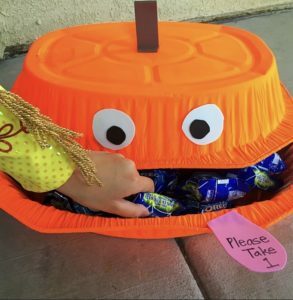 Banish that boring candy bowl and make this cool Halloween bin instead. You’ll need two aluminum roasting pans from the dollar store—“the ones you grab for your Thanksgiving turkey,” says blogger The Typical Mom. Bright orange spray paint provides the color, and a few pieces of construction paper or sticky foam create the face. 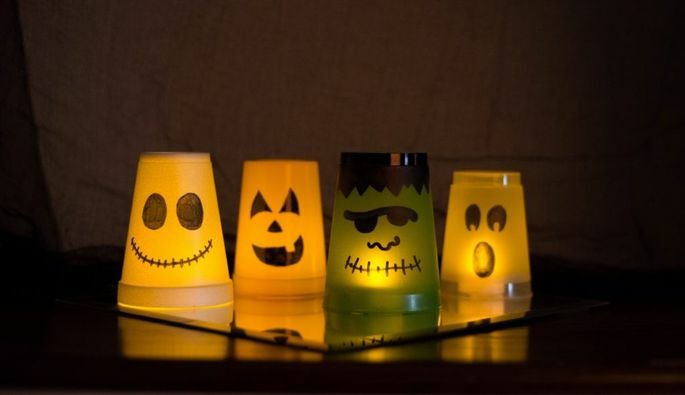 It doesn’t get easier than these Halloween lanterns, which are made from plastic cups, battery-operated tea lights, and black markers. “Draw spooky faces on your upside-down cups. After your marker designs are dry, place a tea light beneath each cup and light ’em up,” says Shelley Grieshop of Totally Promotional. 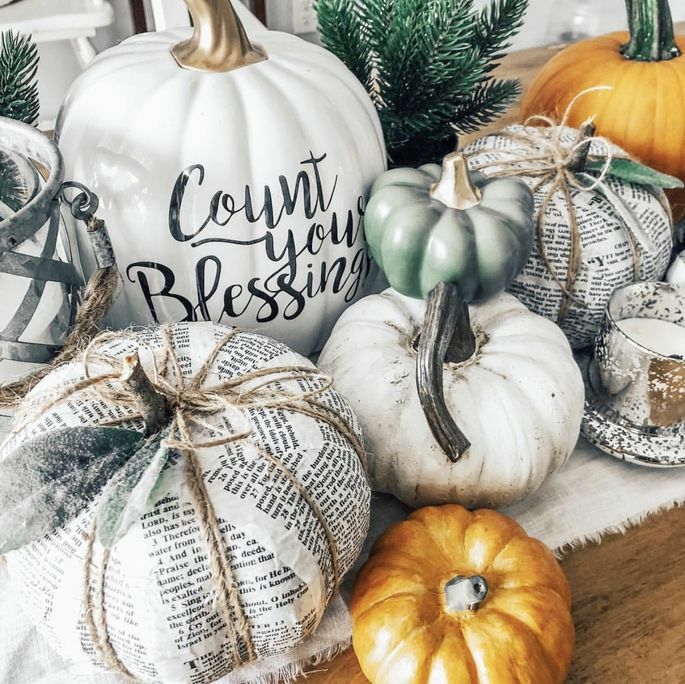 Group a few together as a Halloween mob for a “spooktacular” table setting, place them individually on shelves or countertops, or put one or two in the bathroom as a night light. Dollar store foam pumpkins are a must-have for any crafter, or anyone who simply doesn’t want to deal with the seeds and goo of the real thing. (They’re also great for warmer climates where a pumpkin will go to mush in a matter of days.) They are carveable, so you can still create jack-o’-lanterns. Or, you can turn them into something that looks as if it came from a design store. Paint them, stencil on words or sentences, or cover them in newspaper—the options are unlimited. 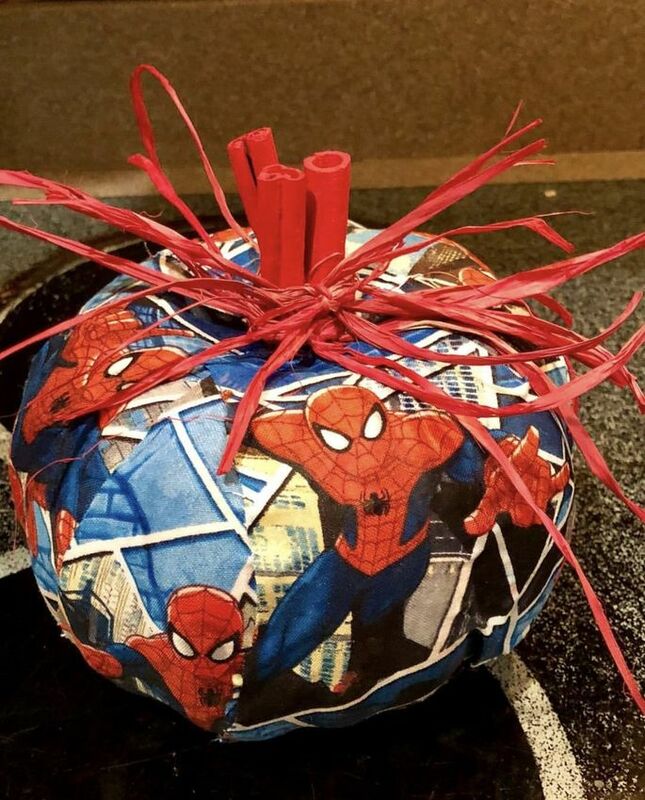 Or swap the newspaper for something Spidey, like gift wrap or a foil balloon, and you have a superhero pumpkin. A little Mod Podge is all it takes to attach the items together. 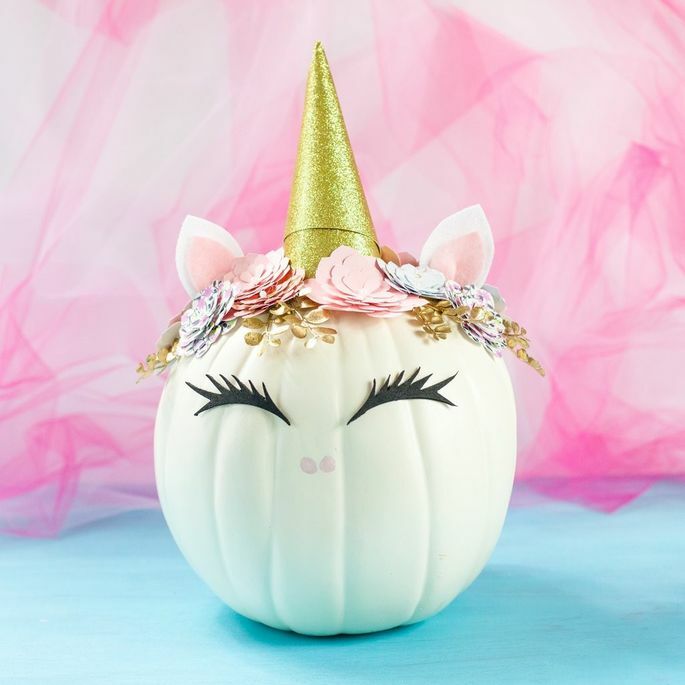 Meanwhile, your little princess will love this unicorn pumpkin. Lynn Lilly, founder of Craft Box Girls, used a variety of materials, including floral sprigs, decorative paper, and foam, and simply hot-glued them in place. Create the horn by rolling the paper and gluing it in shape, then attach the horn around the pumpkin stem. If your dollar store doesn’t have gold paper, look for swaps like gold metallic party plates or foil gift wrap.